F František Mrázek (Red Deer, 1997-99) signed a four-game tryout contract with Weiden (Germany, Oberliga). This season, with David Servis České Budějovice (Czech Republic, Krajské Hokejové Přebory), he had six goals and nine assists in four games. Last season, with Heilbronner Falken (Germany, DEL2), he had a team-high 26 goals, along with 20 assists, in 46 games. D Logan Pyett (Regina, 2003-08) has signed a contract for the rest of this season with Severstal Cherepovets (Russia, KHL). This season, with Admiral Vladivostok (Russia, KHL), he had four goals and three assists in 21 games. He was released by Admiral on Oct. 31 by mutual agreement. There was some WHL history in Kamloops on Friday night as the Blazers played host to the Spokane Chiefs. For the first time, the opposing head coaches were members of the 600-victory club. Don Hay of the Blazers went into the game with 618 victories, while Spokane’s Don Nachbaur was at 606. The Chiefs came out of the game with a 4-2 victory. Hay and Nachbaur trail only the retired Ken Hodge, who put up 742 victories as the head coach of the original Edmonton Oil Kings and Portland Winterhawks. Hay, now 60 years of age, began his WHL coaching career with the Blazers. 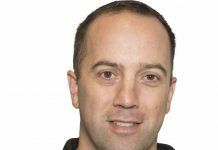 He also has been the head coach of the Tri-City Americans and Vancouver Giants. He spent the past 10 seasons with the Giants, before returning to the Blazers during the off-season. Nachbaur, 55, also has coached the Americans and Seattle Thunderbirds. He went into this season with 598 victories, which had him in fourth place, also trailing Lorne Molleken (603). After Hay and Nachbaur, the winningest active WHL head coach is Mike Williamson, now with the Americans. Williamson, who also has coached the Portland Winterhawks and Calgary Hitmen, has 442 victories after the Americans beat the visiting Victoria Royals 4-1 last night. Williamson is 11th on the all-time list. He needs nine victories to pass Peter Anholt (450) and get into the top 10. F Connor Chartier, 20, who was released by the Spokane Chiefs earlier in the week, had his BCHL rights dealt by the Salmon Arm Silverbacks to the Penticton Vees on Friday. The Vees gave up F Josh Laframboise, 18, in the exchange. . . . Meanwhile, Brian Wiebe, who keeps a close eye on the BCHL, tweeted Friday that F Dakota Conroy, 20, “has decided to join” the Vees “but is waiting on his WHL release.” Conroy left the Prince Albert Raiders late in October. In the OHL, the Erie Otters, playing their first game without F Connor McDavid, dropped a 2-1 decision to the host Niagara IceDogs in St. Catharines, Ont. . . . McDavid, the OHL scoring leader, is out for up to six weeks with a broken hand suffered in a fight on Tuesday. . . . The Otters (16-2-1) have two regulation-time losses this season, both to the IceDogs (6-13-0), who have won four in a row. . . . Earlier in the day, the IceDogs acquired F Josh Ho-Sang, a first-round selection by the New York Islanders in the NHL’s 2014 draft, from the Windsor Spitfires. He had one assist last night. 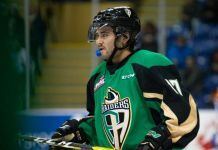 In Prince Albert, F Brayden Point and F Tanner Eberle each scored twice and added an assist to lead the Moose Jaw Warriors to a 5-3 victory over the Raiders. . . . Point finished plus-5; Eberle was plus-1. . . . F Jack Rodewald had three assists and also was plus-5 for Moose Jaw (9-10-2). . . . Point and Eberle have 11 goals each. . . . Moose Jaw D Tyler Brown scored his third goal at 15:07 of the second period to break a 2-2 tie. . . . F Reid Gardiner scored his eighth goal of the season for the Raiders, who have lost four in a row. . . . The Raiders (8-13-0), who are in Swift Current tonight, are 2-4-0 since firing head coach Cory Clouston. They are 1-4-0 under new head coach Marc Habscheid. . . . Matthew Gourlie of the Moose Jaw Times-Herald has a story right here. . . . In Regina, F Dryden Hunt scored three times to help the Pats to a 6-2 victory over the Medicine Hat Tigers. . . . Hunt, who has nine goals, gave his side a 3-1 lead at 16:35 of the second period and 4-2 and 5-2 leads at 5:54 and 10:06 of the third. It was his first career hat trick. . . . Regina F Connor Gay helped out with his seventh goal and two assists. . . . The Pats are 10-9-1. . . . Regina G Daniel Wapple, who was acquired from Medicine Hat on Jan. 10, stopped 39 shots. . . . G Nick Schneider, who went the other way in that deal, turned aside 29 shots for the Tigers (14-4-1), who had a three-game winning streak snapped. . . . Schneider had been 11-0 with the Tigers, including 5-0 this season. . . . Each side was 2-for-9 on the PP. . . . Earlier in the week, the Pats brought back G Tyler Brown, 17, from the MJHL’s Winnipeg Blues. He’ll back up Wapple, 19, while the Pats look for a junior A club where Tyler Fuhr, 19, will play. . . . The Pats are at home to the Seattle Thunderbirds tonight. . . . In Brandon, F Keegan Kolesar, who is from Winnipeg, had a goal and two assists to spark the Seattle Thunderbirds in a 6-4 victory over the Wheat Kings. . . . Brandon (16-4-1) had won six in a row. . . . Seattle D Shea Theodore scored his first goal of the season to break a 3-3 tie at 7:21 of the third period. The goal came via the PP. . . . Theodore was playing his second game since being returned by the NHL’s Anaheim Ducks. He had been with their AHL affiliate, the Norfolk Admirals. . . . Kolesar, who had family on hand for this one, has six goals this season. . . .Seattle (9-8-3) is 2-2 on its East Division swing. . . . F Ryan Gropp scored his 10th goal for the Thunderbirds, while F Jesse Gabrielle got his 12th for Brandon. . . . Wheat Kings G Logan Thompson stopped 27 shots in his first home-ice start. . . . Seattle G Danny Mumaugh made 29 stops. . . . “I thought Seattle was better than our team in every regard,” Brandon GM/head coach Kelly McCrimmon told Rob Henderson of the Brandon Sun. “Their work ethic was superior to ours, they were way more physical than we were. We were not engaged in the game fully at any point.” . . . 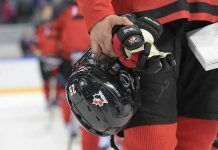 The Wheat Kings had D Ryan Pilon back after a four-game absence with an undisclosed injury. . . . Brandon D Kale Clague is out with an undisclosed injury suffered during the U-17 World Hockey Challenge. . . . The Eastern Conference’s top two teams, the Medicine Hat Tigers and the Wheat Kings, meet tonight in Brandon. . . . In Edmonton, D Ashton Sautner struck for three goals as the Oil Kings beat the Saskatoon Blades, 7-1. . . . Sautner, who has seven goals this season, is the first defenceman in the modern history of the Oil Kings to score three goals in a game. . . . According to a story on the Oil Kings’ website, Sautner had told his billet mom earlier in the day that he needed to get going offensively. “We were at breakfast and we were talking about how we were having a hard time scoring, and I said, ‘Maybe I could step up,’” said Sautner, who last recorded a hat trick as a 16-year-old in midget. “It just happened tonight was a good night.” . . . Edmonton G Patrick Dea stopped 26 shots, losing his shutout when F Cory Millette scored his fifth goal at 18:16 of the third. . . . Edmonton D Dysin Mayo, Sautner’s partner on the back end, scored twice, giving him four, and added two assists. . . . Oil Kings F Brett Pollock had two assists. 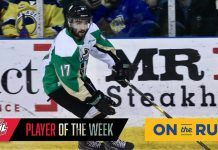 He has three straight two-point games to his credit. . . . Edmonton now is 11-8-2, while the Blades slid to 6-14-0. . . . D Adam Henry (concussion) was back in Saskatoon’s lineup after a four-game absence. . . . Blades G Nik Amundrud, 17, has been out with a concussion since Oct. 31. When he returns, either Alex Moodie, 19, or Trevor Martin, 18, will be kept as the second goaltender. Martin, who stopped 24 shots last night, was brought back from the SJHL’s Melville Millionaires when Amundrud was injured. . . . The Blades decided earlier in the week that D Nolan Reid, 16, will stay on their roster. Reid, from Deer Valley, Sask., had been playing midget AAA at Notre Dame in Wilcox, Sask., when he was brought up by the Blades to help them through some injuries. He has played well enough that the decision was made to keep him. . . . In Red Deer, the Rebels scored four third-period goals and beat the Lethbridge Hurricanes, 4-1. . . . The Hurricanes (5-11-4) took a 1-0 lead into the third period on F Zane Jones’ 10th goal, at 3:07 of the third. . . . F Tyler Sandhu tied it at 4:16 and gave the Rebels the lead at 9:24. He’s got seven goals. . . . F Grayson Pawlenchuk and F Wyatt Johnson each had two assists for Red Deer. . . . With referee Tyler Adair working solo, the Hurricanes didn’t take any penalties in this one, while the Rebels took two minors. . . . The Rebels (10-8-3) have points in nine of their last 10 games. . . . Lethbridge is 0-2-3 in its last five. . . . The Rebels entertain the Saskatoon Blades tonight. . . . The Kootenay Ice visit Lethbridge tonight. . . . In Cranbrook, F Luke Philp scored with 14.3 seconds left in OT to give the Kootenay Ice a wild 7-6 victory over the Calgary Hitmen. . . . Ice F Tim Bozon forced OT with a shorthanded goal at 17:52 of the third period. The Ice had been penalized for too many men as they tried to get G Wyatt Hoflin off the ice for the extra attacker. . . . Bozon has a goal in each of his last three games. . . . The Hitmen led 2-0 in the first period, trailed 3-2 in the second, and led 5-4 and 6-5 in the third. . . . Philp finished with two goals, giving him eight, and two assists. . . . Ice F Sam Reinhart drew four assists, including one on the equalizer and another on the winner. . . . The Hitmen got two goals from F Taylor Sanheim, who has three. . . . Calgary spent the first 59 seconds of OT on the PP after Ice D Rinat Valiev was penalized for delay of game. . . . Kootenay (7-13-0) has won four in a row. . . . The Hitmen (10-8-3) have points in each of their last five games (3-0-2). . . . Taylor Rocca of the Cranbrook Daily Townsman has a game story right here. . . . In Kamloops, the Spokane Chiefs opened up a 4-0 lead and hung on for a 4-2 victory over the Blazers. . . . F Liam Stewart scored twice for the Chiefs. Playing a point on the PP, he scored both goals with the man advantage. He’s got nine goals this season. . . . Chiefs F Kailer Yamamoto had a goal, his third, and an assist as he figured in the game’s first two goals. . . . Spokane F Adam Helewka had two assists, both on the PP. . . . Spokane D Jason Fram, who was playing in his 200th regular-season game, picked up an assist to run his point streak to 11 games. He has two goals and 12 assists during that stretch. Only Swift Current F Coda Gordon, who takes a 12-game streak into a game against visiting Prince Albert tonight, has had a longer run this season. . . . The Chiefs were 2-for-5 on the PP; the Blazers were 0-for-4. . . . Chiefs G Tyson Verhelst stopped 29 shots, 18 of those coming over the last two periods. . . . The Chiefs (9-6-3) moved into a tie with Kamloops for sixth in the Western Conference. Spokane is at home to the Tri-City Americans tonight. . . . The Blazers (9-10-3) have lost six in a row (0-4-2) and are in Everett tonight. . . . In Prince George, F Rourke Chartier scored two more goals to help the Kelowna Rockets to a 6-3 victory over the Cougars. . . . Chartier, who has goals in nine straight games, leads the WHL with 22 goals. . . . He also had an assist, and now is tied for the WHL scoring lead with teammate Nick Merkley, who had one assist. Each has 37 points. . . . F Tyson Baillie also scored twice for Kelowna, giving him 15. . . . Chartier’s second goal, at 10:15 of the third period, broke a 3-3 tie. Prince George F Aaron Boyd had tied the game with his first goal, shorthanded, at 8:42. . . . Kelowna G Jackson Whistle stopped 20 shots in earning his WHL-leading 16th victory. . . . The Rockets were 3-for-5 on the PP; the Cougars (11-10-0) were 1-for-5. . . . Kelowna (19-1-1) is 9-0-1 in its last 10. . . . The teams meet again tonight in Prince George. . . . In Kennewick, Wash., F Beau McCue had a goal and three assists as the Tri-City Americans dropped the Victoria Royals, 4-1. . . . McCue, who enjoyed his first career four-point outing, scored the game’s first goal and assisted on the next three, two of those by F Richard Nejezchleb. . . . McCue has nine goals; Nejezchleb has four. . . . Tri-City G Eric Comrie, who is 7-0-0 on home ice, stopped 24 shots. He lost the shutout when F Tyler Soy scored his fifth goal at 11:17 of the third. . . . Victoria G Coleman Vollrath stopped 31 shots. . . . Nejezchleb scored both goals on the PP as the Americans (13-9-0) went 2-for-6; the Royals (10-10-2) were 0-for-4. . . . Victoria F Brandon Magee had a nine-game point streak end. . . . The Royals are in Vancouver to face the Giants tonight. . . . In Everett, the Silvertips scored two shootout goals and beat the Portland Winterhawks, 4-3. . . . F Ivan Nikolishin and F Graham Millar both scored for Everett in the shootout, while Portland’s first two shooters were blanked. . . . Nikolishin, who also drew two assists, had tied the game 3-3 with his sixth goal at 13:39 of the second. . . . The Winterhawks led 3-1 on F Paul Bittner’s eighth goal at 8:35 of the second. . . . Everett D Noah Juulsen got his second goal, from Nikolishin, at 9:43. . . . F Chase De Leo scored his 12th goal of the season for Portland (8-11-3). . . . D Layne Viveiros had two assists for Portland. . . . The Silvertips (13-2-3) are at home to Kamloops tonight and then will play in Portland on Sunday night. Instead of “helping” and “motivating” your son, you are actually forcing 60 scouts to write “dad: nut-job, don’t draft”.